Definition at line 290 of file lscript_tree.h. Definition at line 293 of file lscript_tree.h. Definition at line 302 of file lscript_tree.h. 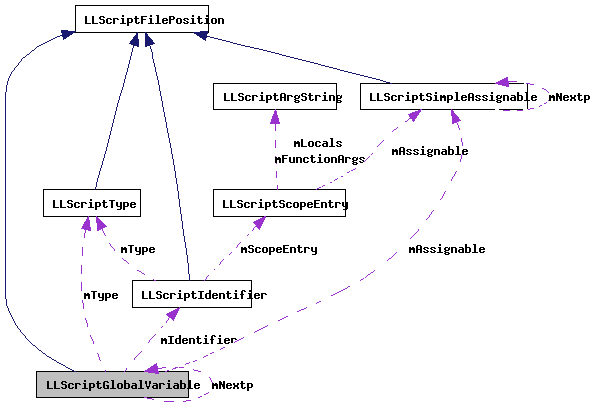 Definition at line 1068 of file lscript_tree.cpp. Definition at line 1283 of file lscript_tree.cpp. References LLScriptType::getSize(), mType, and S32. Definition at line 1077 of file lscript_tree.cpp. References LSCP_PRETTY_PRINT, mNextp, and NULL. Definition at line 1096 of file lscript_tree.cpp. References LLScriptByteCodeChunk::addBytes(), LLScriptScope::addEntry(), LLScriptByteCodeChunk::addFloat(), LLScriptByteCodeChunk::addInteger(), bytestream_int2float(), LLScriptScope::checkEntry(), f, FALSE, gErrorToText, LLScriptGenerateErrorText::getErrors(), LLScriptType::getSize(), gonext(), integer2bytestream(), legal_assignment(), LIT_GLOBAL, lsa_create_data_block(), LSCP_EMIT_ASSEMBLY, LSCP_EMIT_BYTE_CODE, LSCP_EMIT_CIL_ASSEMBLY, LSCP_PRETTY_PRINT, LSCP_RESOURCE, LSCP_SCOPE_PASS1, LSCP_TYPE, LSCRIPTDataSize, LSCRIPTTypeByte, LSERROR_DUPLICATE_NAME, LSERROR_TYPE_MISMATCH, LST_FLOATINGPOINT, LST_INTEGER, LST_KEY, LST_LIST, LST_QUATERNION, LST_STRING, LLScriptScopeEntry::mAssignable, mAssignable, mAssignableType, LLScriptByteCodeChunk::mCodeChunk, LLScriptByteCodeChunk::mCurrentOffset, mIdentifier, LLScriptIdentifier::mName, LLScriptScopeEntry::mOffset, LLScriptIdentifier::mScopeEntry, LLScriptScopeEntry::mSize, LLScriptLibData::mType, LLScriptType::mType, mType, NULL, LLScriptSimpleAssignable::recurse(), LLScriptIdentifier::recurse(), LLScriptType::recurse(), S32, size, and LLScriptGenerateErrorText::writeError(). Definition at line 313 of file lscript_tree.h. Definition at line 315 of file lscript_tree.h. Definition at line 312 of file lscript_tree.h. Referenced by print_cil_globals(), and recurse(). Definition at line 314 of file lscript_tree.h. Referenced by addGlobal(), gonext(), LLScriptScript::LLScriptScript(), and print_cil_globals(). Definition at line 311 of file lscript_tree.h. Referenced by getSize(), print_cil_globals(), and recurse().